The image above is of IC 1613, a dwarf galaxy that is found in the Cetus constellation. 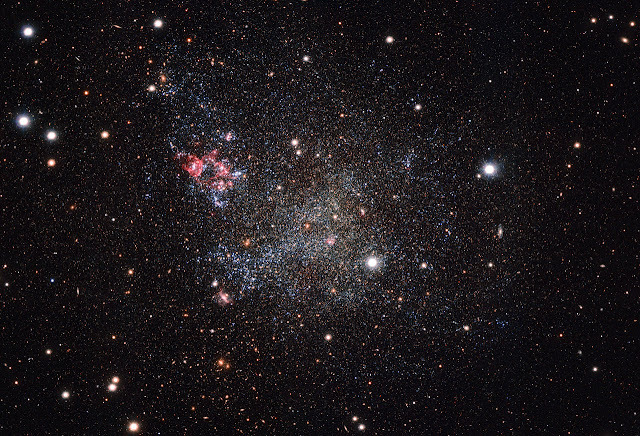 IC 1613 is unique in that unlike other galaxies, this dwarf galaxy contains very little cosmic dust which allows a clearer exploration of what is inside it. Cosmic dust is made of various heavier elements, such as carbon and iron, as well as larger, grainier molecules. Not only does dust block out light, making dust-shrouded objects harder to see, it also preferentially scatters bluer light. As a result, cosmic dust makes objects appear redder when seen through telescopes than they are in reality. Astronomers can factor out this reddening when studying objects. Still, the less reddening, the more precise an observation is likely to be. IC 1613 also contains two types of stars, Cepheid variables and RR Lyrae variables. These type of stars rhythmically pulsate, growing characteristically bigger and brighter at fixed intervals and are used to measure galactic distances. Galaxies come in different sizes. Our galaxy, The Milky Way, is a regular sized galaxy which contains 200 to 400 billion stars. There are smaller galaxies like the dwarf galaxy which only has several billion stars inside it. Dwarf galaxies like IC 1613, are small and have been observed to be pulled toward and merge with nearby spiral galaxies. The OmegaCam was used to capture the image above. The OmegaCAM is a 32-CCD, 256-million-pixel camera mounted on the 2.6-metre VLT Survey Telescope at Paranal Observatory in Chile. Many galaxies are chock-full of dust, while others have occasional dark streaks of opaque cosmic soot swirling in amongst their gas and stars. However, the subject of this new image, snapped with the OmegaCAM camera on ESO’s VLT Survey Telescope in Chile, is unusual — the small galaxy, named IC 1613, is a veritable clean freak! IC 1613 contains very little cosmic dust, allowing astronomers to explore its contents with great clarity. This is not just a matter of appearances; the galaxy’s cleanliness is vital to our understanding of the Universe around us. IC 1613 is a dwarf galaxy in the constellation of Cetus (The Sea Monster). This VST image shows the galaxy’s unconventional beauty, all scattered stars and bright pink gas, in great detail. German astronomer Max Wolf discovered IC 1613’s faint glow in 1906. In 1928, his compatriot Walter Baade used the more powerful 2.5-metre telescope at the Mount Wilson Observatory in California to successfully make out its individual stars. From these observations, astronomers figured out that the galaxy must be quite close to the Milky Way, as it is only possible to resolve single pinprick-like stars in the very nearest galaxies to us. Astronomers have since confirmed that IC 1613 is indeed a member of the Local Group, a collection of more than 50 galaxies that includes our home galaxy, the Milky Way. IC 1613 itself lies just over 2.3 million light-years away from us. It is relatively well-studied due to its proximity; astronomers have found it to be an irregular dwarf that lacks many of the features, such as a starry disc, found in some other diminutive galaxies. However, what IC 1613 lacks in form, it makes up for in tidiness. We know IC 1613’s distance to a remarkably high precision, partly due to the unusually low levels of dust lying both within the galaxy and along the line of sight from the Milky Way — something that enables much clearer observations. The second reason we know the distance to IC 1613 so precisely is that the galaxy hosts a number of notable stars of two types: Cepheid variables and RR Lyrae variables. Both types of star rhythmically pulsate, growing characteristically bigger and brighter at fixed intervals. As we know from our daily lives on Earth, shining objects such as light bulbs or candle flames appear dimmer the further they are away from us. Astronomers can use this simple piece of logic to figure out exactly how far away things are in the Universe— so long as they know how bright they really are, referred to as their intrinsic brightness. Cepheid and RR Lyrae variables have the special property that their period of brightening and dimming is linked directly to their intrinsic brightness. So, by measuring how quickly they fluctuate astronomers can work out their intrinsic brightness. They can then compare these values to their apparent measured brightness and work out how far away they must be to appear as dim as they do. Stars of known intrinsic brightness can act like standard candles, as astronomers say, much like how a candle with a specific brightness would act as a good gauge of distance intervals based on the observed brightness of its flame’s flicker. Using standard candles — such as the variable stars within IC 1613 and the less-common Type Ia supernova explosions, which can seen across far greater cosmic distances — astronomers have pieced together a cosmic distance ladder, reaching deeper and deeper into space. Decades ago, IC 1613 helped astronomers work out how to utilise variable stars to chart the Universe’s grand expanse. Not bad for a little, shapeless galaxy.